Anesthesiology is one of 21 medical specialties in the United States that is currently experiencing a physician shortage or expected to have one in the near future. The causes of physician workforce shortages are multifactorial and include the aging physician population, burdensome debt from medical school, a static production of new physicians, and reduced physician work hours, among others. Expectations for work–life balance, hours spent at work, a culture involving high stress, and burnout are other key contributors to physician shortages. A study published in Anesthesiology by Dr. Orkin and colleagues surveyed thousands of anesthesiologists and other specialists aged 50 and older to determine trends in work activities, professional satisfaction, health and financial status, and retirement plans and perspectives. The goals included identifying the major factors influencing decisions to continue practicing or to retire and evaluating the impact of retirement decision making on the size of the current and future workforce. Several important findings emerged from the study by Dr. Orkin and colleagues. First, older physicians logged significantly more hours of work during the week than other professionals. 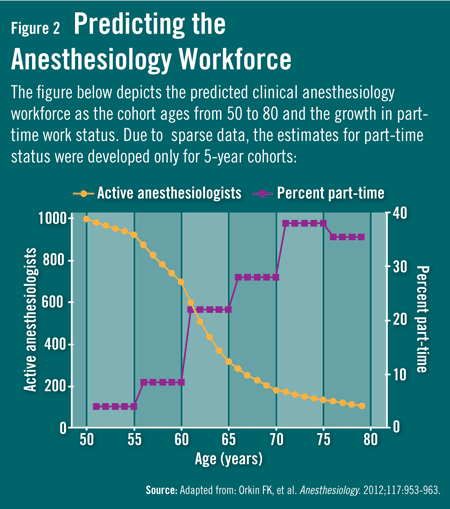 On average, older anesthesiologists and other older physicians worked about the same number of hours per week (49.4), but this average topped that of attorneys (44.9), engineers (43.0), and registered nurses (37.3). Although the length of the older anesthesiologists’ workweek was similar to that of other older physicians, anesthesiologists spent more of their time (81%) in clinical care, especially those specializing in critical care medicine or pain management. Anesthesiologists also participated in clinical care well into their 60s. As anesthesiologists aged, time spent in clinical care decreased and more began working on a part-time basis, particularly women. One-sixth of respondents reported working in a self-defined part-time mode. “Since part-time status is more prevalent among women and more women are entering anesthesiology, this work model is likely to be even more common in the future,” says Dr. Orkin. When compared with other older physicians, several factors were cited as “very important” in retirement planning by older anesthesiologists. More than half reported that their decision to retire from patient care was based on on-call responsibilities. More than one-third cited insufficient reimbursement, lack of professional satisfaction, increasing regulation of medicine, and decreasing clinical autonomy. Conversely, more than two-thirds of older anesthesiologists reported that career satisfaction was the driving force behind deciding to remain clinically active. Orkin FK, McGinnis SL, Forte GJ, et al. United States anesthesiologists over 50: retirement decision making and workforce implications. Anesthesiology. 2012;117:953-963. Available at: http://journals.lww.com/anesthesiology/Fulltext/2012/11000/United_States_Anesthesiologists_over_50_.14.aspx. Salsberg E, Grover A. Physician workforce shortages: implications and issues for academic health centers and poli­cymakers. Acad Med. 2006;81:782-787. Schubert A, Eckhout G Jr, Tremper K. An updated view of the national anesthesia personnel shortfall. Anesth Analg. 2003;96:207-214. Hyman SA, Michaels DR, Berry JM, et al. Risk of burnout in perioperative clinicians: a survey study and literature review. Anesthesiology. 2011;114:194-204. Shanafelt T. Burnout in anesthesiology: a call to action. Anesthesiology. 2011;114:1-2. Durning SJ, Artino AR, Holmboe E, et al. Aging and cognitive performance: challenges and implications for physicians practicing in the 21stcentury. J Contin Educ Health Prof. 2010;30:153-160. Jonasson O, Kwakawa F. Retirement age and the work force in general surgery. Ann Surg. 1996;224:574-579; discussion 579-582. Fredrick K. Orkin, MD, MBA, SM, has indicated to Physician’s Weekly that he has or has had no financial interests to report. Personal Health Record Use in EDs: Willing, But Able?